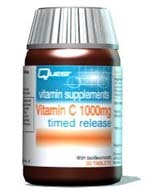 Prolonged saturation of body tissues with vitamin C is achieved by taking a timed release product. Vitamin C is a potent antioxidant, is essential to a healthy immune system and may play a role in blood pressure mechanisms. Especially chosen by those leading hectic lifestyles and highly active people.